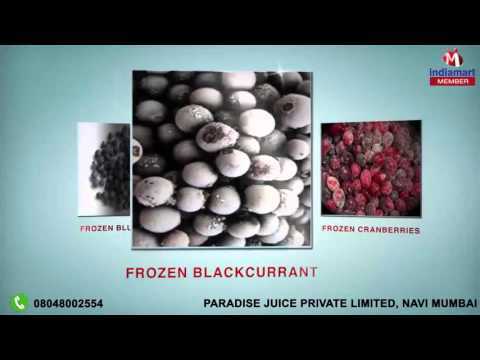 Paradise Juice Private Limited is a renowned organization engaged in Manufacturer,Supplier and Exporter a wide range of Fruit Pulps, Fruit Beverage Bases, Frozen Pomegranate Arils and Frozen Strawberries etc. Our processing knowledge we offer a wide range of premium grade of Fruit Pulps, Fruit Beverage Bases and Frozen Pomegranate Arils .We have gained huge appreciation and acceptance in their market because we believe in providing only genuine products. Our products are designed especially to simplify operations of chain restaurants and franchise chains. Our frozen food products are a solution for bakers, Ice cream manufacturers and anyone else using fruits in their products. Final product is tested at our specially setup FSMS compliant laboratory. So you can be rest assured that you will be serving only the best quality product to your consumer. Our endeavor to update ourselves with latest processing techniques has further helped us in supplying products, without tampering the nutritional value to provide top notch products to client at right time to suffice the anticipations of consumers.